Food Bank Day 2017 is just around the corner! As you are aware, on Thursday 7th December we are pleased to be holding our 4th annual Care & Share in the Community day. We would love it if you could join us for an adjustment visit in exchange for a £30 food parcel. Whilst you are here, Tracy & Nancy will have the kettle on for a cuppa, a mince pie and a chat. We are proud to be supporting Shrewsbury Food Bank PLUS again this year, a self-funded charity that works with the people of Shropshire to serve the community. Since April this year they have fed 1,727 people in 914 households. 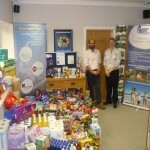 In October alone, they gave 191 food parcels to 93 local households. They do amazing work and the ever-increasing demand on their service is only set to continue. With problems with benefits payments being the biggest reason people are referred to food banks, Shrewsbury Food Bank are likely to be even busier next year as the new Universal Credit is rolled out across the country. The Trussell Trust found that, in the areas where Universal Credit had already been introduced, there was a 30% increase in people using their local food bank compared with just a 12% increase in other areas. This is largely due to the fact that applicants for Universal Credit currently have to wait 6 weeks before receiving their first payment. Christmas can be a very expensive time of year and this can increase the stress significantly when there is just not enough money. So let’s help relieve some of the pressure on those people who are struggling this year by donating something perhaps a bit special. Donations can be luxury Christmas treats or day-to-day essentials, not necessarily just food. ‘Feel-good’ items such as shampoos and body washes are also good, as are nappies, toilet roll and laundry powder. Food should be non-perishable (think tins and cartons) with a best before date of at least 6 months. Also useful for people who have no way of cooking are individually wrapped and single portion foods such as small packs of cereal, ring-pull tins of meat, long-life breads, brioche and croissants. You can find an updated list of the things that are most in demand on the Food Bank website. Do you know someone who could benefit from chiropractic? From the 4th to the 9th December 2017 we are offering initial consultation visits in exchange for a £35 food parcel. This will save any new people you refer to us £20 as well as allowing them to help someone else this Christmas. If you have friends or family who could benefit from chiropractic care, please get them to give us a call. Practice members not booked in on 7th December are also welcome to donate, just drop any contributions off at our office during opening hours or drop a cash donation into one of our piggy banks. Help us help others this Christmas. To book your visit on 7th December, just give us a call on 01743 588 190.